Accordion Cowboy Chris Rybak Says Na zdraví, Y'all! Chris Rybak, a Hallettsville native, was surrounded by music from day one, as he was born into the sounds of his father's band, the Leroy Rybak's Swinging Orchestra, a fixture on the polka scene for over 40 years. Leroy’s wife, Joyce, and toddler Chris were also fixtures at most of Leroy's gigs around the Polka Belt. Chris would hop up on stage playing a plastic trumpet. When he reached the advanced age of six, he started learning music by ear on a small keyboard. 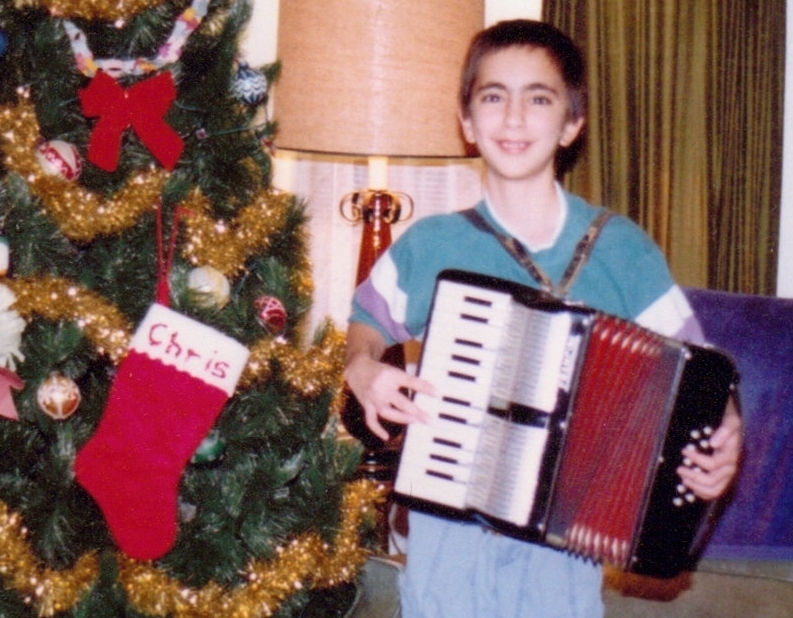 By the ripe old age of 12, Chris received his first accordion and soon played solo at a family event. (Chris still has this $50 accordion and considers it his most prized of his collection of more than 20 accordions.) Playing several instruments with his father's band through junior high school, Chris joined the Hallettsville High School marching band, and was the first student to play an accordion. The highlight of the halftime show was when he and the bass player would play a brief solo (using a new, state-of-the-art wireless sound system). They always received a standing ovation. When it came time to graduate, the school counselor asked Chris what direction he wanted to take his life. “Music,” he said without hesitating. The counselor suggested he think about pursuing a different career, and perhaps later in life he could play music. Heeding this sage advice, Chris worked in a print shop for a very short period of time before taking a giant leap of faith to follow his passion and become a fulltime musician at the age of 18. “There was no guaranteed paycheck to pay for gas to the next gig, no guarantee of anything except the concept of focusing on the music and my audience,” Chris said. Julius Tupa, founder of the Texas Polka News and the Texas Polka Music Association, saw the potential, as he awarded Chris the TPMA New Horizon Award in 1993.
thinking he might be able to make gas money by selling them. He sold all 50. Lesson learned. Chris developed a one-man show, ready to "play at the opening of an envelope." This refers to working musicians’ daily gigs of performing at car dealerships, grocery stores, and other businesses that would hire popular entertainers to perform as a public draw. Most of these events happened during the 8 to 5 timeframe. Bob Wills and Adolph Hofner grew their fan base this way. Chris said the most rewarding of these type of shows were performances at senior citizen centers. “It’s always a great deal of satisfaction to watch folks’ eyes light up and smiles spread across their faces as, maybe for the last time, they are hearing the Julida Polka sung in Czech, as they recollect dancing the night away decades ago,” he said. it to the music industry at the next NAMM (National Association of Music Merchants) convention, which was going to be held in Austin. convention. Chris was successful, so successful that Roland made him an advisor and flew him to Italy to assist with the introduction and design of a new model. Chris to many different cultures as the company sends him and his accordion to venues throughout the U.S. and overseas. One of Chris’ proudest moments was to perform for the Czech Republic president, prime minister, and other government dignitaries. promote my music,” Chris said. He showed his gratitude with a CD called Shiner Time, produced in 2010.
jaunts and heritage festivals, and collaborated on a CD – Two Kings of Accordion, recorded in 2012. The Czech-Mex tracks take turns featuring Czech classics like Clarinet Polka, and conjunto favorites, like Viva Seguin Polka, written by Santiago Sr.
ZICKE ZACKE ZICKE ZACKE HOI! HOI! HOI! promote all kinds of heritage – Czech (Westfest in West, Kolache Festival in Caldwell), German (Oktoberfest in Fredericksburg, German Heritage Festival in Tomball, where Chris has his own party stage), Polish (Houston Polish Festival), Tejano (Big Bang Salsa Fest in Three Rivers), and Cajun (Fiddlers Frolics in Hallettsville). The latter had hometown boy Chris headlining Cajun Night this year. “My family always went to this event and my dad would say, ‘One day, you’re going to play here.’ He didn’t get a chance to see me play (his father passed away in 2012), but I think he had a hand from above in getting me in the lineup,” Chris said. He debuted his latest CD Cajun Baby at this year’s festival. It features the song Going to Hallettsville, which tells the story of going to the Fiddlers Frolics. biergarten, which was frowned upon by other festival acts, wanting to remain true to the period and not introduce today’s technology. Chris reported most of the other stages now usewireless. “Yeah, we changed the landscape of the Ren Fest,” Chris joked. Depending on the event, Chris recruits other musicians to round out his band. Mainstays include guitarist Marvin Kremling, who played in Leroy’s band, and drummer Jonathan Statsky. Of course, Chris’ wife of 16 years, Edita, also joins in on vocals, offering authentic pronunciation of Czech lyrics since she hails from Slovakia. Chris also brings in brass, reeds, tuba, fiddle – whatever is needed to keep the polka party going. friends,” said Dennis Pustejovsky of the Waco area. “It’s great when we go to an event like the Praha Picnic and see a group of people who have toured with us. They immediately raise their drinks and greet us with ‘Na zdraví,’ because we are always toasting to each other’s health (with slivovitz) on our tours,” Edita said. In the spring of 2011, Chris became the proud father of a beautiful daughter, Kristina Nicole, who is already walking in her father's bootsteps. 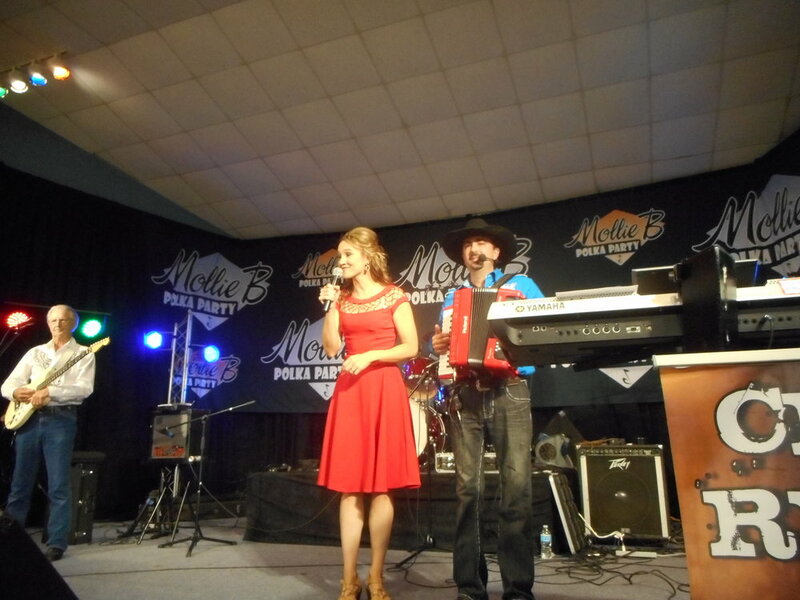 She is showing much interest in music and has even appeared in national newspapers and television programs, such as the Mollie B Polka Party and early morning news programs. wouldn’t change a thing. “I think back to those who said, ‘You’ll never make a living playing accordion.’ I’m glad I didn’t listen,” he said. This writer wonders if he has ever played Frank Sinatra's immortal (I did it) My Way. Chris' CDs are available in the Polka On! Store. Several fellow polka lovers offered their congratulations to Carl Finch, recently inducted into the International Polka Association Hall of Fame. Read the cover story by Gary E. McKee from the August 2016 issue of Texas Polka News. musicians. The music was wild, different and so much fun. The crowd was just going crazy. Dancing on the floor, tables, chairs, on the grass. It was out of control, but in a good way. People were eating them up. I used to actually dance those super fast polkas. Not anymore! LOL! One of my early favorite Brave Combo tunes is Three Weeks Polka. Another one I really like is Polka Dancer Polka off of their Polka Sonic CD. That entire CD is my favorite. My favorite tune to watch them get the crowd going has to be the Hokey Pokey or getting the conga line started. People go crazy. These guys are a lot of fun. Carl and I go way back and he has always been professional. He has helped a lot of bands get a chance to play for entirely different audiences. Back in the early Czech & Then Some days, Carl would have us open up for a couple of gigs in Deep Ellum in Dallas. That's a wild scene. Brave Combo has become a huge part of our festivals in Texas. The National Polka Festival and Westfest would not be the same without Brave Combo. They know how to play for the people. It was always fun when Danny (O'Brien), Jeffery (Barnes), or Bubba (Hernandez) would sit in with Czech & Then Some, but it is really special when Carl comes up and plays accordion with us. He and David Slovak playing two accordions together really gets the crowd going. I am so excited that Carl has been elected to the IPA Hall of Fame. He has done so much good for polka music and the entire polka scene. They created their own style and sound, but can still play traditional style polkas and waltzes. Brave Combo started a new wave in polka music. Carl has made Texas proud. Congratulations Carl and wishing you the very best on your induction into the IPA Hall of Fame! Polka On! The first time I heard Brave Combo's music was on the CDs we received from Rounder Records. Their recordings of classic tunes like Julida Polka and Apples, Peaches, Pumpkin Pie, plus original tunes and arrangements of the old traditional songs blew me away. I could tell they weren't your normal, everyday polka band. The first time I heard Brave Combo live was at Wurstfest in the 1990s. Me and the late B.J. Sablatura were doing a live remote for KULP Radio. They were doing their show in the big tent right across from us. There were a couple of thousand people, mostly college students partying like crazy with Brave Combo getting them all wound up. It was like a rock concert. We had Carl come over and talk with us on the air afterwards. They were leaving for Holland and a European tour the next day. The next time I saw them live was at John Dujka's 40th birthday party at Hungerford Hall. I haven't had a chance to see them again lately, but I do play lots of their music on KULP. We feature their recording of Must Be Santa during our Christmas holiday programming. Carl is a musical genius covering all styles. As I said earlier, they blow me away! BC's music is 180 degrees from our music but they're able to give most of the public what they want and are making a living doing it. We've shared the stage with BC numerous times and the entire group, especially Carl, has been very complimentary and cooperative. Every time we saw/heard them we always had to hang around to see what new "musical gimmick" they had contrived. Congratulations, Carl. I first experienced Brave Combo when I was about 10 years old and was at WMUH in Allentown, PA (where I co-hosted my dad's radio show). I was raised in a household with a lot of different kinds of music, but that opening of Happy Wanderer was totally shocking for polkas. I inhaled that record. I would play Lovesick over and over. When I finally heard and met the band in person, years later, it was awesome to jam with them and especially have long conversations with Carl about all the different polka styles and how they cross over to other music. I've greatly enjoyed and respected his dedication to the music - especially since he wasn't "born into it." Having performed and recorded with BC in myriad venues through the years, I specifically remember Cain Park in Cleveland, OH in 2002. Bubba (Hernandez) and I had just started putting the Polka FreakOut project together and we were playing Uzmi for Steve Popovich (the famed record man from Cleveland International who was a deep Serbian tamburasi) and Carl came running over with such an excitement for the music- as the phrasing, structure was different than many polkas. We talked for about an hour about all of the intricacies of the style. It just struck me that he had won Grammys, performed in some of the most prestigious venues in the world, and had maintained his pure love of music. Something I have watched only continue to grow in the years since. Congrats, Carl! The recognition is long overdue. Thank you for all you have done to inspire other musicians and entertain so many audiences in all of these years. Viva La Musica! I was shocked when I first saw Brave Combo at Westfest. I was 16 and had just begun to listen to rock-n-roll by choice, but when I thought of hearing polka, I expected the traditional stuff. It took a little while to get over that, but their energy was infectious, and I'm hyper, so it became symbiotic. Flying Saucer is one of my favorite BC tunes. It's fast, it's loud, it reminds me of being a child and imagining cool things. Another fave isn't a polka, it's a South African folk song called Skokiaan. Carl and the guys can deliver that song like no other! Carl and the musicians he works with are musical chameleons. They can work any crowd. I wish I could have been there when they did the Lowlands festival in the Netherlands in 2000. I listened to the audio of that concert, and listened to the man introduce them in Dutch (and the audience's reaction). Then, I heard how the audience just went wild (and stayed wild for the rest of the show) by the second song. All of a sudden, polka was cool. My very favorite memory of seeing BC in concert was when Ross and I were on our honeymoon in Ennis in 2008. Carl invited Alex Meixner to play some songs. WOW, what a show! Carl invites Ross and I up to help lead Edelweiss from time to time, and he asks me to teach Schottisch lessons during their shows. He's always been very kind to help promote me and our band. He's asked me to jodel Auf Der Jodeleralm with them a few times. He sings the words, I jodel, then we get distracted headbanging. My dad got a picture of it from the 2007 Saint Arnold Brewery Oktoberfest. Records label. Flying Saucer is one of my favorite BC tunes, but there are many others. performers from Texas and beyond. I was a little girl when I first saw Brave Combo at the National Polka Festival the first time they played. I really liked them. My parents had a couple of their records. My favorite Brave Combo tune is Three Weeks Polka and I love to see them get the crowd going with The Twist. There are so many words and things you could say about Carl and Brave Combo. But some of the things that stand out to me are the performances that Carl gives. You always know when you experience and leave a Brave Combo show you get their best and they give everything they have to their performances. Carl has truly expanded polka music, exposing so many to the music and art that would never had otherwise experienced it. Congratulations, Carl! This honor is greatly deserved. Brave Combo has been a large portion of my musical influence for the overwhelming majority of my life. I was around the age of 10, and already playing polka music. I guess you could say I was studying them before even I knew I was. Carl is an amazing person with an amazing work ethic that is only surpassed by the ginormous amount of passion he puts into polka music. Whether he's playing or working to help others understand how badly this world needs to polka, he's doing it with all of him. He has been deserving of this great honor for quite some time now. with my brother, Mark, and the late, great Tommy Strmiska on drums. Carl, thanks for your always daring and refreshing approach to polka. You've opened minds everywhere. he first I saw bc was at Sefcik Hall in the late '80s. The raves I heard about BC proved to be true. I loved it. The most novel instrument was the percussion pole with all the beer caps and the crowd loved it every time it was brought out. Later another Melody 5 band member and I ran sound for them at Sefcik Hall - got to know Danny (O'Brien, incredible trumpet player) and the rest of the band from that point of view. That was fun and interesting but nerve racking as I wanted everything to be up to their expectations. Worked out great and had a blast. Always marveled at Jeffrey's (Barnes) sax and clarinet playing and loved Bubba's (Hernandez) solid bass line. Carl has kept the whole thing going which is a credit to his passion for BC music and music mastery which draws from every genre and style. He is a great showman and knows how to get the crowd involved. Lots of songs get the crowd going but after several adult beverages I always liked the conga line!! Congrats Carl - well deserved!! Kristina Rybak (pink hat) had a great view of Pope Francis on the last tour; Rudy and Bea Patek partied with the Rybaks at last year's Oktoberfest in Munich. 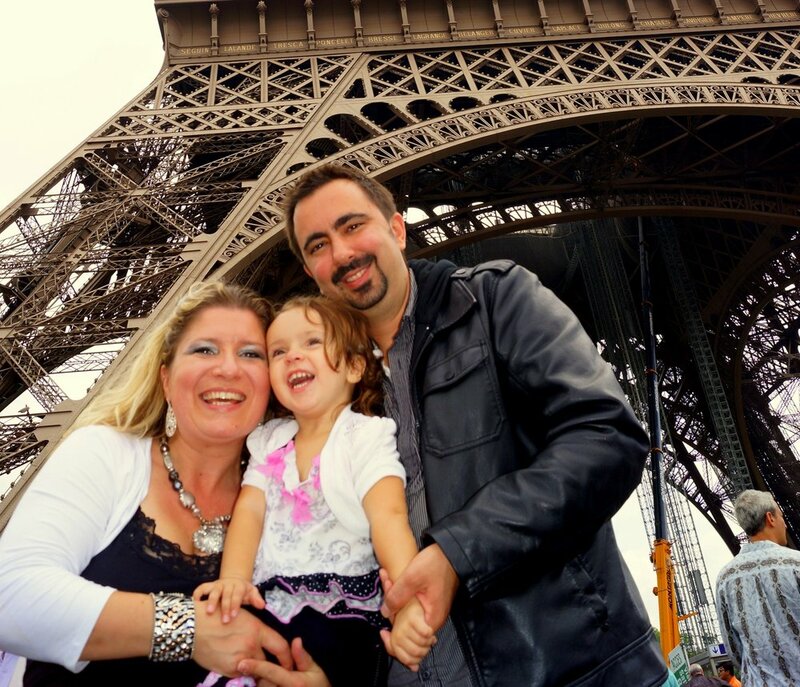 Chris & Edita Rybak invite everyone to join their 2016 Europe Tour to the Czech Republic, Austria, Italy, Vatican and Germany! The tour is scheduled from September 11 - 23 and will feature the beautiful scenery of Europe, an audience with the Pope, churches, castles, Munich Oktoberfest, wine and beer tastings, shopping for souvenirs and music by Chris Rybak while traveling. There will also be polka parties with local bands and a dinner cruise in Prague. "Whether you want to try the Pivo & Kolaches in the Czech Republic or visit with the Pope at the Vatican, this is a tour for you!" the Rybaks said. 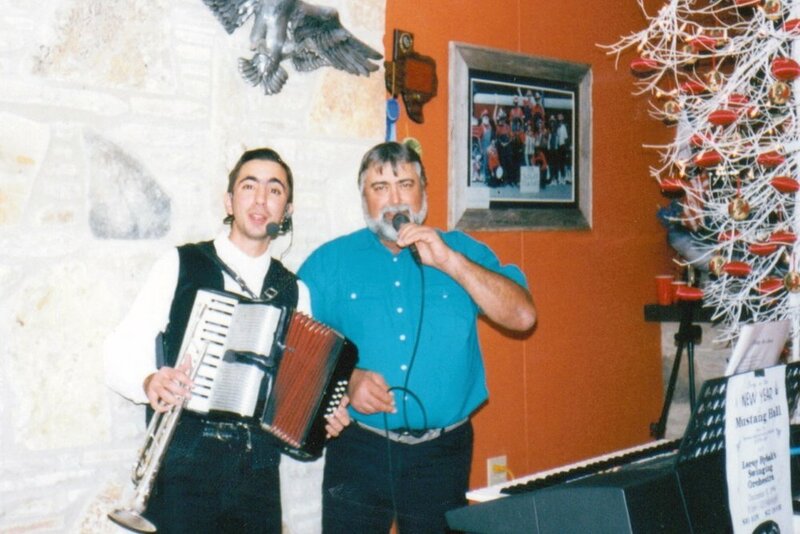 Chris & Edita Rybak are established polka promoters in Texas, and Chris Rybak, sometimes referred to as the "Accordion Cowboy," performs regularly solo and with his own band all across Texas! You'll visit ancient Rome where you can see coliseum, Venice with gondola rides, Vatican with the Sistine Chapel and the Pope, Klagenfurt with the Minimundus Park, Salzburg the birthplace of Mozart, Munich where we attend the Oktoberfest, Vizovice where they make Slivovice Jelinek, eat grilled chicken at the Koliba Vlcina party, in Lichnov search for your ancestors at the Texas museum and in Prague take a dinner cruise after touring the historic city. The tour includes flight, hotel accommodations, luxury bus, program, meals, drinks, professional tour guide, and music. "Please reserve your seat today as space is limited," the Rybaks said. For additional information, contact Edita Rybak at (512) 963-6660 or (361) 772-4703 or by email at editarybak@hotmail.com. More info on this tour can also be found at www.chrisrybak.com or http://www.texasczechs.com. Where there's music, there's dancing, especially when it's Czech polka music! A crowd of 125 enjoyed the presentation in Austin./Gary E. McKee photo See more photos. With flood threats and warnings abounding, this writer questioned the wisdom of attending a function being held in a basement. But this wasn't any underground shelter, it was the Texas Capitol Extension Auditorium in Austin. Descending into this secure, dry, beautiful labyrinth, it was surprising the number of tourists visiting this hallowed building on such an ominous day. The reason for this journey was to attend the presentation of Varied and Vibrant Sources of the Czech Song in Texas – a lecture/demo by accordionists and music scholars Frances Barton and Dr. John Novak in support of their forthcoming book. Frances and John have been compiling a collection of folk and popular songs of Czech Texas for several years and are nearing completion of their project. The finished songbook (late 2016) will contain 90 songs familiar to most people in the Texas Czech community and will include the music, chords, Czech lyrics, English translations, English lyrics if there are any, and historical and folkloric information on each song. The presentation, attended by over 125 enthusiastic souls, featured the origin of six popular songs, Julida Polka, Shiner Song, Wedding Song, Beer Barrel Polka, and two others. After a history of each song, Frances and/or John would perform the song on their accordions with the audience chiming in singing in either Czech or English. Those needing a little help on words could read the lyrics from a huge screen in the back of the stage. On several selections, Frances' daughter, Jubilee, accompanied Frances and John on the singing of songs in Czech. The mother/daughter harmonizing spellbound the audience. The event was offered in conjunction with the multi-media exhibition Texas Czechs: Rooted in Tradition, which is currently on display at the Capitol Visitors Center (112 E. 11th Street in Austin ) in Austin through June 11, 2016. It was produced by the nonprofit organization PolkaWorks and co-curated by Texas Czechs Lori Najvar and Dawn Orsak. It is being presented at the CVC by the State Preservation Board. Mark your calendar for Saturday, June 11, for Big Czechs, Little Czechs, an afternoon of family activities that features food, language, kroj, music, and dance. The event will be held from 1-4 pm. “The next song goes out to Bennie and Kathy Bronikowski: The Chappell Hill Special.” This dedication is a regular at many polka dances, however few dancers understand the significance of the song. The song gives a nod to the town of Chappell Hill, one of the approximately dozen Polish settlements in Texas, located between Brenham and Hempstead, Texas. In the mid-1800s Polish immigrants began to arrive in Texas. The primary areas of settlement were Panna Maria (southeast of San Antonio), Brenham, Bremond, and Chappell Hill to name a few. They brought their Catholic religion, culture, and music to the new world. Their Polish music, which is string-instrument based, has been handed down orally from generation to generation. The original music typically consisted of a fiddle, a bowed bass, and an occasional clarinet. As time went by guitars, drums, and accordions were added. Brass horns were never fully accepted into Polish music as the popular feeling was that it Czechanized the music. This isn’t a negative comment on Czech music, it’s just that horns were not popular in the old country and they were protecting their roots. The Polish Oberek is a traditional dance that can only be described as a real fast waltz with a lotta foot-stepping in a highly spirited fashion. As with all music there are regional interpretations influenced by geography and politics both in the old country and new world. There are basically two flavors of Polish music in Texas. One is the Chappell Hill type, which infuses a rhythmic sound into the mix. The other is the Bremond style, which reflects the music that would be found in the villages of central and southern Poland. Tradition dictated that a fiddler was hired for entertainment at functions and it was up to the fiddler to provide accompaniment. Brian’s father was a guitar player in a band in the 1950s and ’60s that played mostly Country & Western music, but would bust into Polish music when the crowd was right. His grandfather, Ed Marshall, was a fiddler in the 1940s and ’50s, but was equally well known for his stage presence as a Druszba (emcee) at Polish weddings and public events. In the tradition of a family band, Brian’s two teenaged sons, Jakub and Michal, have been performing with their father for years on clarinet and fiddle. At the Polish Festival in Bremond (June 26-27, 2015), Brian’s cousin, Ronnie Kasowski played guitar, and his son Jake, was thumping the bass fiddle. On drums was Chuck Bolin, who is married to a cousin, so it was truly a family band. Thank you Brian Marszalek (Marshall) for posting and sharing information on your heritage. Brian has performed all over the U.S. including the Lincoln Center in New York, National Folk Festivals in Maine and Massachusetts, the Festival of Americana fiddle tunes in Washington, to name a just a few. He is now signed with Arhoolie Records, a music label that specializes in American masters of roots music. Brian will conduct a workshop and perform Polish fiddle music at the 2nd Annual Festival of Texas Fiddling on November 7th. This festival is an opportunity to see multiple styles of music performed on the same instrument. The Joe Patek Orchestra, founded by John Patek, was the result of John bringing his musical abilities from Moravia when he immigrated to the Lavaca County area in 1888. After playing in various community bands around Shiner, John formed his own orchestra in 1920. In the 1940s, his two sons, Joe and Jim, joined the band, with Joe assuming leadership. The band became a regional favorite among the Czech communities of South and Central Texas, particularly with The Shiner Song and Beautiful America. Their recording of an 1800s Mexican folk song, Corrido Rock, even appeared on Tejano jukeboxes. Patek’s Orchestra recorded more than 24 78-rpms (thick heavy vinyl platter) and 24 45-rpms (smaller, large hole), and several tapes (cassette and 8-track) and LPs (large, thin, small hole). The Patek Band had a signature sound that set it apart from others in the U.S. with a strong brass sound and emphasis on swing. For years, the band played with only a single microphone for the lead singer. This lasted until the 1970s when a second microphone was added to boost the acoustic guitar, and by 1980, three microphones were used when performing. The stories surrounding the Patek band and associates are endless, but this one reveals the loyalty of their fans. Quentin Hoffman and his wife loved to dance. They made two or three dances every weekend back in the day when Bill Mraz’s Ballroom and Lodge 88 were holding polka dances every weekend. One night, Quentin went up to the Lodge 88 bandstand to request one of his favorites, the Youth and Pleasure Polka. As he was guiding his niece around the floor, he crumpled to the floor, stricken by a heart attack. Quentin had always said that when the time came he wanted to die dancing. He got his wish, but just too early; he was only 55. Later, when Quentin's son, Johnny (who had witnessed his dad's passing), got married, he danced the Youth and Pleasure Polka with his mother. The popularity of the band by the 1950s found them playing at least twice every weekend and being booked a year in advance. It must be noted that the vast majority of polka musicians to this day have day jobs, and playing music is not financially rewarding; they do it cause they love it. One musician told me he looks at it this way: "I get paid to travel, set-up, and tear-down, the time between is pleasure." The Patek Band with various members continued until its final performance at the Annual Fireman’s New Year’s Eve Dance in 1982. In 2013, the Texas Czech Heritage and Cultural Center in La Grange put together a tribute to the Patek Orchestra by assembling a crack group of veteran musicians to recreate music that the Patek band had created. By all accounts, both band side and audience side, the Patek magic came alive that clear, moonlit night as opposed to the cold and rainy night 31 years earlier when the music stopped. Performing that evening was one of the final two members of the band, Daniel Malik. The other surviving member was Paul John Darilek, who had filled in for several months following the death of one of the Patek brothers in 1982. When I arrived in Shiner to interview Daniel Malik, I was personally unfamiliar with him and unsure how smooth the interview would progress. Arriving at a well-kept house in Shiner, the door opened and a handsome, open, smiling face greeted me. Daniel, with the aid of a cane, escorted me into the dining room, where on the table a fantastic display of photographs and posters of the Joe Patek band was laid out. When he sensed that the Patek Orchestra was nearing the end of its amazing 62-year run, he began gathering memorabilia. As his lovely wife, Carolyn, entered the room he was proudly showing me the poster advertising the last performance of the Patek Orchestra in Shiner and the poster of the last out of town performance of the band in Needville. Carolyn was digging in a box and produced tickets and photographs to the last performance of this legendary band. Daniel’s father and uncle both played polka music informally with family and friends and Daniel played along on trumpet. This feeling of camaraderie instilled the desire to entertain and play music that was fulfilled when the Charlie Tousek Orchestra had an opening for a saxophone player. Daniel went right out, bought a sax, learned to play it by ear, and was a member of the orchestra two weeks later. After doing several years with them, he left to become a founding member of Yoakum’s the Hub City Dutchmen. The Dutchmen once performed 14 days in a row. They had been invited to perform in Wisconsin and booked a gig in each state that they drove through there and back. In 1970, an opportunity presented itself for Daniel to fulfill his dream, there was an opening in the Joe Patek Orchestra for a sax player. There was only one problem, he had his own band, The Dutchmasters. He privately discussed it with Joe, voicing the conflict with his own band. Joe understood and told him to go talk it over with his band members. When Daniel assembled his band at the local cafe, he had apparently forgotten he lived in small town, as they already knew he was being considered for the prestigious position and told him to go for it. When I asked Daniel why he had always wanted to play with the Patek band, he immediately responded, "Their style!" Thus, Daniel began his 12-year stint with the Patek orchestra. The seven-man band he joined was already one of the hardest working bands at the time playing three gigs a weekend. Daniel related how once, they left Shiner at 12:30 on a Saturday afternoon, drove 300 miles to San Angelo, played, packed up, drove back to Shiner arriving at 7:30 on a Sunday morning, got out of the station wagon, went to 8 o’clock Mass, went home, showered and changed shirts, got back into the Patek wagon, where they drove to East Bernard (only 72 miles!). They played the Kolache Festival, drove back to Shiner, arriving at 5:30 p.m., and he went home to Carolyn who had a big pot of chicken noodle soup waiting, which he consumed, and went to sleep. That adds up to 744 miles, two gigs, in 27 hours! The Bill Mraz Ballroom in Houston, had a standing agreement that every two weeks the Patek Orchestra would play, which went on for years. In 1962, when Daniel first started out with the Tousek band, the musicians were paid $7 a night, and later when he played with Hub City Dutchmen, he made $10 dollars a night. When Daniel finally reached the Patek band, Joe was paying them $14 a night. Other gradual changes occurred during Daniel’s time with the Pateks. One large station wagon now pulled a trailer with the Shiner Beer emblem on it, replacing the two vehicles, and meat wagon (from the family's Patek Meat Market). And, as mentioned earlier, the band went from using one microphone on stage, to eventually having three mikes. After the last performance of the Joe Patek Orchestra on New Years Eve, 1982, the band dissolved. Daniel was burned out from playing several times a weekend for over a decade and rarely picked up his sax for four years. (A 1982 dance listing shows 28 gigs that year.) An opportunity to play with The Wence Shimek Band came along and Daniel returned to the stage to play sax with them for five years before retiring again. Now, he sits in with the Shiner Hobo Band, and is mentoring his 13-year-old granddaughter, Cindy, who is proficient on flute, piano, alto and tenor sax, and presently learning guitar. 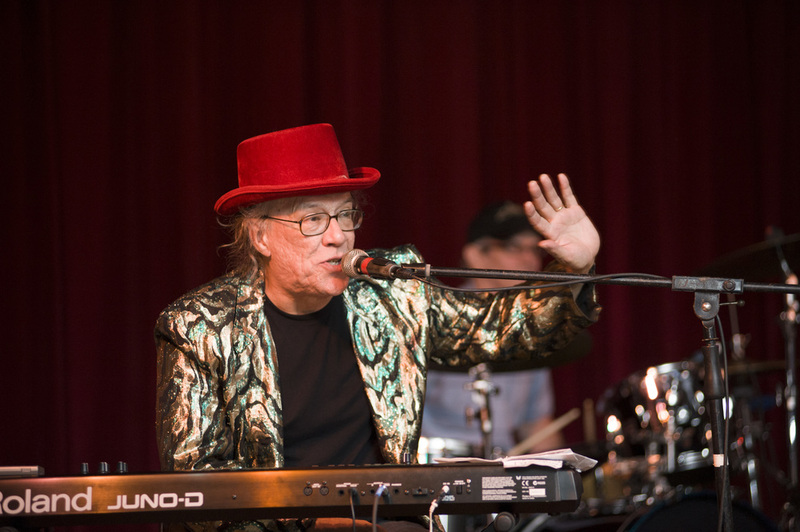 The spirit of the Patek Band was once again resurrected on October 17, at the Texas Czech Heritage and Cultural Center in La Grange, as Daniel Malik and other top-notch musicians brought the magic sounds of The Joe Patek Orchestra back to life again. See the photos. The Patek sound never left, it just took a really long break. WOO-HOO-HOO! “Circuit Riders” was the name given to preachers in the 1800s who traveled the physical and spiritual wilderness bringing, on horseback, the word of God to the Great American West. Martin Ruter (Rutersville) was a great example, who in 1837 entered Texas with a stack of Bibles and hymnals to preach to and sing with the citizens of the newly founded Republic of Texas. Among those still carrying on this tradition in the 2000s are Bruce and Shara Repka. However, instead of riding horseback thousands of western miles, they trailer their beloved horses and instead of stacks of bibles and hymnals they are equipped with voices and musical instruments to implement their horse ministry. Bruce’s family has deep roots in Lavaca County where his father, Henry Repka along with Herbert Kloesel from Schulenburg, founded the music program at Sacred Heart Catholic School in Hallettsville. Bruce’s musical trip began at a single digit age listening to his father performing in a popular polka and waltz band, The Music Kings, around the Houston area. His father would make cassettes of their performances and bring them home, where young Bruce would listen to them and play along on a plastic accordion purchased from Sears. One day his mother brought Henry to Bruce’s room to hear him play and he was soon playing on a “real” accordion. At the ripe old age of 10, he performed on a Music King “45” rpm record (the ones with the BIG hole in the middle). The song was the Honeybee Waltz. From that point onward Bruce accompanied his father as they played the Mraz Ballroom, Lodge 88, and various KC Halls in a 50-mile radius of Houston. Bruce’s intrigue with music, led him to learn the guitar, steel guitar, fiddle, and keyboards. As with most great bands, time took its toll and The Music Kings disbanded. Bruce continued playing in several country bands both in Central Texas and Houston. In 1996, Bruce decided to focus on playing and singing about God’s grace and love. Being interested in the western culture, he gravitated towards the cowboy churches that were springing up throughout Texas and the west. In 2001 Bruce was attending the Crossroads Cowboy Church in Yoakum and met a lovely lady named Shara. They realized that they shared more than spiritual feelings and were married in 2003. At that time Bruce was singing with Mike Ables from Bellville in a duo called The Calvary Cowboys. The Christian Country Music Association of Nashville rated them in the top 5 acts in 2004, 2005, and 2006. When Mike stepped down, Shara took his place, and the Pony Express Ministry singing duo was formed. Bruce and Shara have been traveling the west performing at different venues focusing on “ranch rodeos” which are events that involve real working cowboys and cowgirls. These rodeos are fundraisers for various charities that assist young cattlemen to continue in their chosen field and action groups that assist in livestock disease prevention programs and the protection of western rangeland among many similar worthy causes. While traveling from rodeo to cowboy churches, Bruce and Shara have released four CDs of their music, most of which are original songs. Visit the Pony Express website to learn more about the ministry and purchase their uplifting music. For almost a decade, Texas Folklife has been hosting a Big Squeeze accordion competition spotlighting young accordionists across Texas. 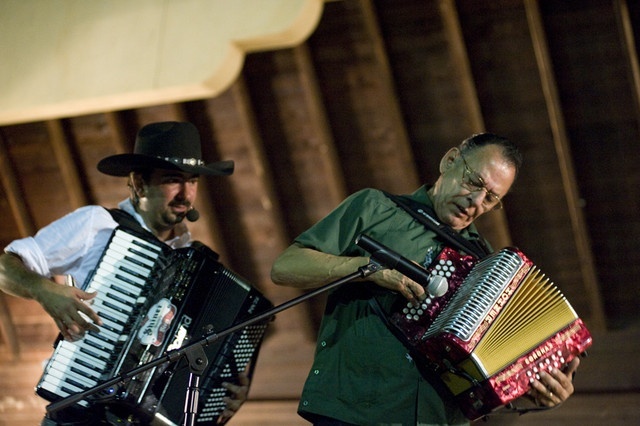 The competition in 2014 marked the first time that grand prize winners would be selected in three categories – polka, conjunto and Cajun/zydeco. Big Squeeze winner in the polka category was Garrett Lee Neubauer of Altair. Garrett has been playing accordion since the age of 12. When his father, Daryl, passed away prematurely, he felt that the best way to honor him would be to pick up his father’s accordion and learn how to play it. His father had been an accordionist in the Tony Janak Polka Band. Between managing a rice farm, and playing, Daryl took time to guide a young Mark Hermes (of the Czechaholics) on the art of playing accordion. When Garrett made his decision, Mark returned the family favor by showing him around the keys of Darryl’s accordion, which had once belonged to Bobby Jones. Lawrence Ruether, Garrett’s grandpa, also played the accordion and taught him some songs. As Garrett’s skill increased, other members of the Czechaholics, Brian Klekar and Greg and Brian Svetlik mentored Garrett on the intricacies of music and performing. I remember going backstage several years ago at a Czechaholics gig at SPJST Lodge 88 in Houston and finding Garrett playing along while behind the curtains, learning the songs. Down a sandy country road that leads to a lush, serene oak grove that Garrett calls home, he would spend evenings practicing while sitting in the yard or out by the stock pond. He has ample time for this as he works in the maintenance department at Rice School district just five minutes away. Both he and his dad graduated from there. His neighbors, Gladys and Joe Salinas, big polka fans, would enjoy the notes floating across the cow pasture in the evenings. As Garrett’s confidence and licks improved through the many hours of practice, he was asked more frequently to sit in with the Czechaholics and Texavia. The Tony Janak Polka Band has reformed as the J & S Playboys, and Garrett sits in occasionally to fill his father’s shoes. Though he loves playing all genres of music his favorite is the Czech polkas and waltzes that he grew up listening to his father play. His desire to learn more about the unique instrument grew and now he owns four keyboard and two button accordions including the one he won at the Big Squeeze competition. In case anyone stops by and wants to jam, Garrett also owns an electric bass guitar, a keyboard, an electric six-string guitar and a set of drums. The six-string guitar is what he spends more time on now as he is still in the learning stage. The Texas Dream Band, a country/polka band out of Hallettsville is Garrett’s regular gig now, playing keyboards and accordion in this band composed of the offspring of other country/polka musicians. But whenever he isn’t playing with Texas Dream, Garrett can be found with his accordions ready to take the stage wherever polka is happening. There is no doubt that his father would have been proud. Gary E. McKee visited with Vernon Drozd. During the interview, Vern took a liking to Gary's Polka On! shirt, so Gary gave him one. “God gives you a gift, but you have to learn to use it,” was Vernon Drozd’s words to live by, and live by it he did from a very early age. Growing up on the family farm in Moravia, where he picked cotton across the fence from TPN founder, Julius Tupa, Vernon could not wait to get home from the fields to practice the clarinet that his dad had borrowed from neighbor Donnie Wangler. Later, when there must have been a good cotton crop, Vernon’s father bought him his own clarinet from Herbert Kloesel for $144.50. Herbert operated Herbert’s Swing Inn in downtown Schulenburg, a combination music store and drinking establishment. In Hallettsville High School, Vernon spent two to three hours a day rehearsing and then after the chores were finished he would play scales for up to two hours every night. The practice paid off with Vernon landing his first paid gig at the age of 15 with the Joe Fajkus Polka Band from Praha. Vernon’s education on the realities of the music business was formed with the Fajkus Band when they played a venue in San Antonio for four hours and then were told that the club didn’t make enough to pay them. Joe Fajkus attempted to get gas money from the promoter but was turned down. Over the decades, since his first gig in 1944, Vernon has shared the stage with many prominent musicians. The list is long, but his two favorites are Joe Patek (three years), and Johnny Bush, which led him to backing up Willie Nelson. Ray Krenek, Henry Brosch and Gil Baca also had Vernon’s sax and clarinet sweetening the sound. During the 1970s, Vernon fronted his own band called The Texas Brass, which had two saxes, two trumpets, bass, drums and guitars playing country and polkas with a passion. When asked whom he had wished he had performed with, Vernon motioned towards the large Elvis artwork on the wall, and then thought, and lamented that he never got to play with Merle Haggard. Curly Long and the Wild Ones with Texas Brass members Vernon Drozd (left) and Brian McWhirter (center). The SPJST upstairs hall in Taylor was one of Vernon’s favorite places to play, as the acoustics were great and the 600+ crowds kept the dance floor full, and ensured a payday at the end of the night. His first venture into the recording studio was in 1958, with Ed Copeland producing the Joe Patek Band. Vernon’s respected reputation as a sideman also meant he was featured on dozens of other recordings. Vernon Drozd, the man who amazed crowd by playing three saxophones at once, is living proof that practice and dedication rewards those who recognize God’s gifts and shares them with the world. The new king and queen of the Polka Lovers Klub of America Texas Chapter, Russell and Barbie Loitz of Sugar Land, were crowned at the Klub’s January meeting in Sealy. Randy and Kathy Cernosek of La Porte will continue to serve as prince and princess. Both couples look forward to promoting the Klub and its mission to keep the polka tradition alive and well. “We love the Klub’s goal in making sure our heritage and love of dancing is passed on to the next generation,” Barbie says. As for favorite songs, it’s Black Gypsy Waltz for Barbie. “The Red Ravens always play it for me, at least I take it they play it just for me.” Russell likes Pretty Dancing Girl. Kathy’s faves are Pivo and Kolaches and Moon over Moravia, and Randy likes Young Girl Polka and Blue Skirt Waltz. Click here for more information on the Polka Lovers Klub of America Texas Chapter and learn how to become a member. He may feel like he’s moving slowly these days at age 74, but his routine since he and the Vrazel’s Band retired in 2009 proves otherwise. A typical day for Alfred begins by rising about 6 or 7 a.m. (earlier in the summer) and having breakfast with his wife of 53 years, Bernice. She then heads into the computer room to manage paperwork for their farming and ranching enterprise. Alfred travels about a mile down the road to the farm shop where he meets his brother, Albert. The two still farm and ranch together. They spend the morning checking and feeding the cattle and also repairing farm equipment. Brothers Anton and Lawrence, who have retired from farming, usually stop by to visit and no doubt offer their two cents of advice. “We always clicked good together,” Alfred says of his brother partners in farming and music. It’s busier during the summer as Alfred and Albert still raise corn and wheat. He reports good yields for both crops this past summer. Sometimes it’s so busy in the summer months, Alfred doesn’t even eat lunch and works until dark, but occasionally he tries to indulge in an afternoon nap when he can. “We don’t farm as much as we used to. We’re slowing down a little bit every year,” he says. Pomaly. Alfred and Bernice are members of Sts. Cyril and Methodius Catholic Church in Marak, and when the church needed someone to manage their parish hall, Bernice and her sister, Patsy Gaines, volunteered, which meant Alfred did, too. It was to be for one year and, “Seven years later, we’re still managing the hall booking weddings and reunions. It keeps us busy,” he says. Managing the church hall seems a natural fit since the Vrazel family managed the SPJST Hall in Buckholts from 1957-1971. Alfred also likes to spend time in his music room. He and Bernice just recently had the time to hang all the plaques Alfred and the band received over the years. He also now has time to listen to some of the Vrazel’s recordings. “We played in Washington, D.C., in 1976 for the bicentennial celebration. They recorded us, five days worth of music. Now, 38 years later, I just started listening to it,” he says, noting, “It sounds pretty good.” And, of course, he likes to pick up his button box and play a song or two every now and then. The sax too, but not as much. One of the plaques Alfred hung on the wall was presented to him this past September in Cleveland, Ohio, where he was inducted into the International Polka Hall of Fame. He was honored for his role as a polka DJ for the past 59 years on KMIL in Cameron. What made it even more special was Alfred is the first Texan to be inducted into the hall, which is located in Chicago. The Vrazel’s Polka Show will celebrate 60 years on the air this coming summer. The show started as the Vrazel Polka Hour, a live broadcast with the Vrazel’s Band every Sunday on KMIL 1330 AM. The station had just come on the air and needed programming and the Vrazel’s were a young band just getting started and they needed publicity. The show was on the air from 1 to 2 p.m. then the band would head out to a gig. “Back then, they had Sunday night dances from 9 to midnight, so we had plenty of time to do the show and get to a dance,” Alfred recalls. The band did the live show from 1955 to 1960. “The Sunday dances started being held earlier so we didn’t have time to do live radio performances. Plus, the recording of polka music on labels like TNT was starting to take off,” Alfred says. From 1960 to about 2000, Alfred did the broadcast live. Bernice, and later daughter, Cindy, would come to the station to take phone-in requests and sort through the mailed dedications the station received. Now the show is mostly pre-recorded. The weekends have changed for Alfred and Bernice. “For over half a century, we had to be somewhere on Saturdays and Sundays. Now, we enjoy sitting on the couch on the weekend,” Alfred says. At the height of the Vrazel’s popularity, the band was performing 125 dates a year. “We’d play a dance in Dallas on Saturday night, then head to Corpus Christi to play with The Majeks the next day. We were a lot more sturdy back then,” Alfred says laughing. And as all wives have to make adjustments to their schedules as their husbands retire, Bernice says it’s taken some getting used to having Alfred home on the weekends. “When Alfred was on the road with the band, I had the choice of either going to the dance or staying home to do what I wanted, like shopping. Now, he’s underfoot all the time. But I have to admit, he’s good at steering the Wal-Mart cart,” Bernice says, laughing. He says he was nervous as heck doing that first radio show. “But as the Sundays went by, I got more relaxed. Just like playing a dance, once you pick up your instrument, tune up, count off one two three, here we go, you get into the music and the nervousness goes away,” he says. Alfred’s show has expanded to two hours and 15 minutes on Sundays from 12:15 to 2:30 p.m. on KMIL Cameron, which is now 105.1 FM. He has had some of the same sponsors for many years, such as SPJST, Slovacek Sausage and the oldest – Anderle Lumber Company in Cameron. He credits the success of the program to the loyal listeners who enjoy the music and many who he connects with on a farming level. Alfred is usually a regular at jams these days and he has sat in with the Red Ravens a few times last year. He and Bernice also like to attend dances to, well, dance. He doesn’t always bring his accordion but if asked, he’ll pick up one of the band’s and join in on a song or two. “I enjoy playing. Now I don’t have to worry about being a bandleader. I don’t have to set up the sound system. It’s great,” he says. Alfred’s favorite polka is The Bandleader Polka, which he plays to open his radio show. Favorite waltz is At the Spring. And he likes classic country such as Ray Price and Merle Haggard. “Classic country is just good dance music. It fits polka bands real well. Back in the ‘50s we wanted to incorporate something to entice more young people to come to the dances. We were one of the first polka bands to have electric bass and play country tunes,” he says. So is Alfred expecting another pomaly year in 2015? “It will be hard to top last year when I got that phone call telling me I had been chosen for the hall of fame. It really caught me by surprise,” he says. He and Bernice would like to go to Chicago this year to visit the International Polka Music Hall of Fame Museum to “see what’s what” and check out his plaque, which, thanks to Alfred and Bernice, also has a copy of the Texas Polka News October 2014 issue next to it, that carried the story about the induction ceremony. The couple also hope to spend more time with their daughter, Cindy, and grandchildren, Matthew and Jessica. Congratulations to Cody Janak and Kendall Kristynik who received this year's scholarships sponsored by the Polka Lovers Klub of America Texas Chapter I. Each received $500 to help with expenses as they set out on their college adventures. 2014 PoLK of A Scholarship Winners Cody Janak and Kendall Kristynik with Scholarship Chair James Freytag. The scholarships were awarded at the Klub's meeting on Sunday, July 13, at the American Legion Hall in Sealy. See more photos from the event. Cody Janak of Victoria graduated from St. Joseph High School and is the son of Chris and Stephanie Janak and the grandson of PoLK of A members Henry and Carolyn Janak of Yoakum. Cody will be attending Texas A&M at College Station, majoring in Mechanical Engineering. Afterwards he plans to continue his education by seeking an MBA or law degree. In addition to his outstanding academic and athletic achievements, he supported his community and church as a teen leader during activities like blood drives, Women’s Crisis Center fundraisers, ACTS Religious Retreats and nine years as an Altar Server. Cody is a three-year member of the National Honor Society and has worked as a sod-grass layer, fiber optic technician and performed farmer-rancher duties at his grandparent’s farm where he also learned to can pickles, make sausage and bake kolaches. He claims that his dedication to hard work, outgoing attitude and friendly personality, which he inherited from his parents and grandparents, has successfully gotten him this far in life. And, the fact that he loves to dance has not been a hindrance in any way. Earliest memory of a polka dance: When I was 5 years old. I had just learned how to dance, and I was asking every lady around me to dance. I was on a roll, but after nine or 10 dances, I was turned down. I was heartbroken and decided I was done for the night, so I went to sleep on one of the tables at the dance hall. Polka tunes on your MP3 player: I do not have any polka songs on my iPod, but I do listen to the Yoakum/Hallettsville radio station during the polka hour when I am at my grandparents. Favorite polka: Out Behind the Barn and Shut Up and Drink Your Beer. Favorite polka band: Red Ravens. How to get more young people to come to polka dances: By advertising on social media and providing food. Because all kids enjoy the Internet and food! Kendall graduated from Moulton High School and is the daughter of PoLK of A members Kenneth and Mary Kristynik. Kenneth plays accordion for Red Ravens. Kendall will be attending Texas Lutheran University in Seguin, with a goal of obtaining a degree in the field of medicine. Besides being the valedictorian of her graduating class and homecoming queen, Kendall has been active in Student Council, 4-H, the Lavaca County Council and the Bata Club, holding multiple offices in each of these organizations. She has served as her class president during each of her high school years and has been on the All-A Honor Roll since first grade. Kendall’s goal in life is to be 100% happy – and she says that since life can throw unexpected curve balls, it is her intent to live life in a way that she will have no regrets, be able to laugh often and love deeply. Earliest memory of a polka dance: When I was three or so. My dad played every weekend, sometimes twice, and I went along every chance I could. I remember going to Mustang Hall between Yoakum and Hallettsville and helping my mom sell tickets. When she wasn't looking I would go out on the floor and do what I loved - dance. Polka tunes on your MP3 player: Absolutely. Polka is in constant mix. As much as I love Texas Country/ Red Dirt music, when I hear my dad's accordion through my headphones, I can't help but smile and be in a good mood. Favorite polka: Looking, Looking Polka by the Red Ravens. At my graduation in May, my class did a montage as our class song. Everyone picked a song that meant something to them, and mine was the Looking, Looking Polka. Everyone's face just lit up. It was amazing. Favorite polka band: The Red Ravens, by default and because my dad is an avid polkabeat reader, I am bound to this answer. :) However, I grew up with the Dujka Brothers, the Vrazels, and Fritz Hodde, so all are at the top of my list. How to get more young people to come to polka dances: Going to polka dances isn't something that you can force. Polka is a way of life, and if they don't love it, then a person isn't going to do it. Polka is sometimes viewed as something that "old people" do, so teens feel that they are "too cool" to polka. What we can do is keep playing polka music, and there is no doubt that people of all ages will continue to embrace this amazing way of life. Stay Strong and Polka On! Just wanted to pass on our sincere thanks from all of us Tomball polka lovers for all you did to support the German heritage festival. We all look forward to seeing the various acts. We particularly enjoyed Alex Meixner and when I saw that you were sponsoring his return here, the least I could do was say Thank You Very Much!!!! Keep up the great work and I will keep an eye on all the latest polka happenings thanks to polkabeat.com. Thank you again!! I would like to say thank you to you and Polkabeat.com, for all of your contributions to the Tomball German Heritage Festival. I know that is sponsorship, and that you covered the event. 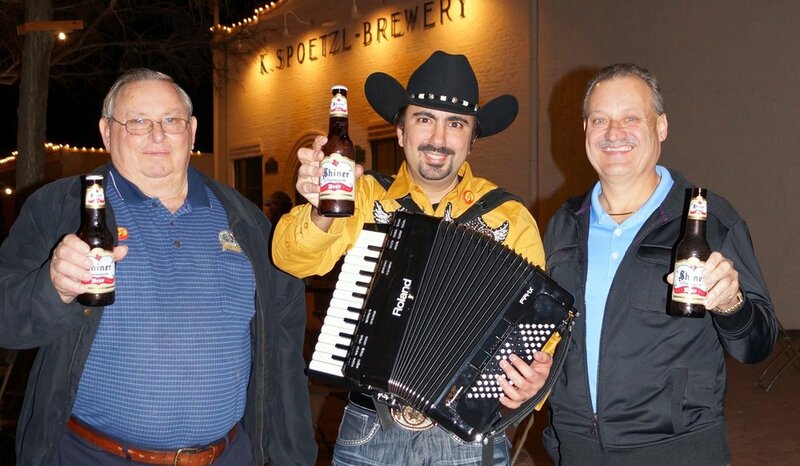 The truth is that you are doing much to further polka music in Texas. I, for one, am very glad you are doing this. Once again, I’d like you to know that The TubaMeisters support your cause. Love ya, Mom! Way to go on bringing Polkabeat this far! You're awesome! Happy Birthday! Wishing you all the luck, good health and happiness. You are making so many folks happy and healthy with all the dancing and laughter - best medicine. It was nice hearing that you are a sponsor of the Czech show on KOOP here in Austin. Thank you for your great website and weekly dance listing. We have had a great time exploring the nooks and crannies of Texas while polka dancing - and we have found out about many of these dances through your website. Thanks for all you do to publicize bands and live music in Central Texas and across the state! Thanks a million for all that you do to promote the heritage, my friend. Was great to see you out again this evening. Peace to you and yours. The July general membership meeting of the Polka Lovers Klub of America Texas Chapter I is my favorite Klub event to attend. That's when we announce the winners of two $500 scholarships given to family members of our members. Each year, I am blown away by what these young people have already achieved. Hearing their plans for the future gives me sense of calm that our country is going to be okay with them in charge. And these are just two outstanding students. The Klub received 17 applications, all to be commended for their achievements and future aspirations. I was also pleased to see these two recipients are proud of their polka heritage, one commenting the the PoLk of A is such a cool club. Meet this year's winners: Michael Laitkep and Abby Sumbera. Michael graduated from Friendswood High School and is the son of Chris and Donna Laitkep and the grandson of Ernest and Delores Laitkep of Pearland. Besides being an outstanding student, Michael has aggressively participated in extra-curricular activities and held leadership positions in various organizations while supporting the needs of his school, his community and various church programs. He has participated in sporting events, such as swimming, soccer and track, science fair programs, church activities and played trombone in the marching band. He is an Eagle Scout and member of the National Honor Society. Michael will be attending the University of Texas at Austin, double majoring in business and Plan II Honors, a broad liberal arts program. Afterwards he plans to continue his education by seeking a master's in business or a law degree. Abby graduated from the St. Agnes Academy and is the daughter of Darrell and Kim Sumbera of Houston and granddaughter of Leonard and Grace Sumbera of Schulenburg. Besides being an outstanding scholastic student, Abby has held leadership positions for St. Agnes retreats and within the Girl Scouts She was secretary of the Spanish Honor Society and is an accomplished athlete with at least 10 years of competitive soccer. She is a member of the National Honor Society and the Science National Honor Society. Abby will be attending Texas A&M, majoring in Biomedical Engineering – a rewarding and important field – certainly for the many veteran amputees looking for new limbs -- an area within her major that she intends to pursue. Polka thoughts Favorite polka memories: Going to the St. John's 4th of July picnics for as long as I can remember and dancing with my family. I have great memories of learning to dance with my grandpa and my dad. Favorite polka: A Ja Sam (All by Myself) Polka. Favorite polka bands: Red Ravens, Dujka Brothers and Shiner Hobos. Polka on iPod: Vrazels album. Polka promotion: I encourage young people to join clubs like PoLK of A. I intend to try to get groups of my friends together to go to dances so they can see what it is all about. Thanks for the Encouragement Ben! At the reception in the Schulenburg KC Hall following Ben Sustr's funeral (which was attended by many uniformed members of the Polka Lover's Klub), Shiner Hobos Johnny Barton, Walter Hermis, Leo Rainosek, Larry Krupala and Nathan Loth took the stage. Today, I said goodbye to Jimmy Brosch. I knew the day would come. After all he was 89 years old. But somehow it hit me hard. I cried through most of the Polka Mass held in celebration of his life. And what a life! He was a pilot, motorcycle rider, speed boat captain, railroad switchman, egg salesman, car salesman, horse rider, bull charmer, molasses maker, boxer, fiddle player, harmonica player, saxophonist, band leader, dancer, singer, entertainer, writer, artist, comedian, beer drinker, Catholic, Democrat, businessman, friend, husband, dad and grandfather. And I probably forgot a few. He packed a lot into those 89 years. I had known about Jimmy all my life as my dad had all of his albums. I was formally introduced when he came to my dad's funeral in 2009 and played some of my dad's favorite polka tunes on his harmonica. Jimmy, as I would learn, never left home without his harmonica. You never knew when the mood would strike for a polka or country tune. Then I saw Jimmy at a dance at Lodge 88 in Houston. I had just started polkabeat.com in honor of my dad and planned to start a "legends" column and wanted Jimmy to be the first person I wrote about. He agreed to be interviewed and invited me to come over to his house. While we were talking, he said, "Why don't we write a book? I have these polka bands I want to write about. People have forgotten them and I think their stories need to be told." I jumped at the chance and we set on our way to write about 10 Texas Czech Polka Bands. Then Jimmy increased it to 15 and finally 20 legendary polka bands. For a year and a half, we traveled to the homes of the families who shared their stories, photos and hospitality. Little did Jimmy's wife, Lucy, know this would become her project, too as she drove Jimmy to many of the appointments. We also were joined by Mark Hiebert who documented the visits with his camera. These were interviews, but they seemed more like visits - remember how people used to go visit friends and spend the afternoon talking? I had the privilege of not only breaking a kolache or two with some of the most down-to-earth people I have ever encountered, I was there for personal concerts - Jimmy jamming with Alfred Vrazel, singing and jamming with Helen Kurtz Shimek and Laddie Kurtz, playing harmonica to Clarence Baca's percussion, singing while Dan Pavlas played accordion and Bernice Migl Dobecka played piano and watching June Krenek on the dulcimer. Once all the interviews were done, I started getting the calls. Have you written any of the chapters yet? Do you have some more for me to read? I would tell people at polka dances, "Don't tell Jimmy I was here. I'm supposed to working on the book!" I worked with Jimmy's son, Jeff, who designed the wonderful cover for the book and laid out each chapter. To keep Jimmy busy while we were working on the book, I suggested he create a companion CD to the book featuring a song from each band. After all, we were writing about music, you should be able hear it! Jimmy liked telling people, "While you're reading a chapter on Joe Patek you can cue up his song and listen to his music." He researched printing shops and calculated and recalculated what we should charge for the book and the combo price for the book and CD. And hardly anyone qualified for a "free" copy of the book. I had to pay for mine! We enjoyed the book signings. The best was at Cactus Music. Folks were lined up to get his autograph on the book. Some brought albums they wanted him to sign. All had a story about how his music touched their lives, or the lives of their parents. It was a great day! Jimmy always signed the book, "To my good friend..."
I will miss Jimmy's early Saturday morning calls to give me his "weekly report" about how many books he had sold and how the stores on his route were doing in selling our book. The Polka Mass was wonderful. I lost count of how many musicians showed up to play one last song - the Corn Cockle Polka. You've heard the saying, "they played their hearts out." Well, they did. It was a rousing version and we didn't want it to stop. I was so glad to hear Willie Bohuslav announce that the Polka Lovers Club of Texas Museum will plant a bed of corn cockles in Jimmy's honor. See Remembering Jimmy Brosch. See Jimmy's Last Polka Dance. Read the Houston Chronicle story. Thanks for Promoting Polka Mister John! John Zavadil, polka DJ at KCTI Gonzales has discontinued his polka show due to health concerns. John, known as "Mister John" by his listeners underwent gall bladder surgery and complications and had spent time at Gonzales Memorial. Methodist San Antonio and New Braunfels Regional Rehabilitation hospitals. The 1450 Polka Club with the most "live" polka music in Texas for 17 years, five days a week, three hours a day. In a statement issued by KCTI 1450 Program Director Egon Barthels said, "Mister John will be dearly missed by all of us. I want to thank John for his many years of service to KCTI AM 1450 and the Gonzales County community. We have enjoyed many great moments with Mister John as the host of the 1450 Polka Club. Mister John was also a huge asset in helping gather community news, rainfall reports, birthdays and anniversaries, obits as well as helping with day-to-day operations at the station." John received the Texas Polka Music Awards (TPMA) Polka DJ of the year in 1996 and was nominated again in 1997. John is of Czech, German and Swiss heritage. He served his country for 10 years with the 36th Infantry Division Army NG at Fort Hood and Fort Polk obtaining the rank of Sgt E-5. John taught public school 30 years, all in Gonzales County, never using a "sick leave" day. John married Erlene Kubečka Pšenčík December 17, 1997 at the First Evangelical Lutheran Church in Gonzales. A very proud moment for John and Erlene was receiving the 100 years Family Land Heritage certificate presented to the Zavadil Ranch south of Gonzales from Texas Department of Agriculture Commissioner Todd Staples on November 8, 2012. The ranch was founded in 1910 by Inocenz Zavadil. I will miss Mister John's polka show. He was one of the first to get onboard with what I was trying to do in establishing polkabeat.com. He promoted my site and helped Jimmy Brosch and I sell lots of our book -- Jimmy Brosch Remembers Twenty Legendary Texas Czech Bands. It would be a shame to not play the impressive library of music Mister John built. That's why I was glad to get an email from Egon saying the polka tradition continues with the KCTI-AM 1450 Polka Club airing between 5 and 7 PM every day. He says the reason for the time change is because it was the only way he could conduct his daily operation duties but still keep the tradition of having polka music on KCTI-AM 1450. AND I was glad to hear he still does "Dance Dates" from polkabeat.com just like Mister John! Thanks Egon and thanks for keeping polka alive on KCTI! For more information go to kcti1450.com. As in many states, there is a Czech settlement in Oklahoma. The term “Sooner” applies to settlers in the late 1800s. Sooners were people who were able to legally enter the Oklahoma Territory prior to statehood. Some Sooners crossed into the territory illegally at night, and were originally called "moonshiners" because they had entered "by the light of the moon." Sooners would hide in ditches at night and suddenly appear to stake their claim after the land run started, hours ahead of legal settlers that began on April 22, 1889. Among the Sooners, who illegally claimed land before the Land Run of April 22, 1889, were about 25 Czech Americans led by Anton Caha, a Moravian who had been born in the village of Klanchov in the 1850s. As a youth, Caha had immigrated to America with his mother and stepfather, and he spent the first part of his adulthood in a Czech settlement in Colfax County, Nebraska. With a background as a militia leader in the Second Sioux War (1876), Caha was an adventurous man who led his Czech group into the Unassigned Lands and attempted to stake his claim at a location just west of present day Oklahoma City. Like many others, the Czech Sooners were prosecuted for their breach of the law, and Caha himself served a two-year sentence in the federal prison at Leavenworth, Kansas, before returning to Oklahoma and establishing himself as a respectable citizen. Apparently his land claim held up as the site incorporated the Canadian County townships of Yukon, Mustang and El Reno in the present day Oklahoma City area. Shortly afterward, Czech family groups settled in the area that later became Kingfisher County and in the community of Mishak, Boone Township, Oklahoma County. These first groups were typical of the Czech Americans who would continue to be attracted to Oklahoma in the following two decades. The majority came from immigrant colonies that had been previously organized in Nebraska, and others came from Kansas, Iowa and Texas. Furthermore, many of the Nebraska Czechs had previously immigrated from Wisconsin and many from Kansas had come via Chicago. Fast forward to 2013 - this writer had always seen an exit sign for Czech Hall Road on Interstate 40 and finally had time to pull off in Yukon, Oklahoma, and see if there was still a Czech Hall that the road was named after. I found a wood frame structure that was built in 1925 that resembled some halls in Texas. There was a granite historical marker in front that indicated it was listed on the National Historic Register of Historic Places. The present hall replaced the original structure built in 1899 and was the Sokol Karel Havliček Lodge and Western Fraternal Life Association Lodge Jan Žižka No. 67 headquarters. The Sokol organization was the gymnastic training center for the Czech culture. The German equivalent would be the Turnverein halls found in German culture centers. This particular hall has the distinction of having dances every Saturday night since 1925!!! The hall has a good website, www.CzechHall.com, which tells its story in more detail. I contacted LaVerne Benda via the phone number provided on the website. LaVerne was a delight to talk with and possessed a wealth of information on Oklahoma Czech culture. Upon entering the hall, my initial impression was that the architecture was very similar to the hall at Shelby, Texas with the arches leading to the seating tables on both sides of the hall. Lining the walls were hand-painted Czech designs. In the corner was a small, orderly museum relating to the hall and the Sokol lodge. What impressed me most were the charters to the lodge given by the Territory of Oklahoma in 1899 (Oklahoma was granted statehood in 1907). The band was – as it is most Saturdays – was The Bohemian Knights. The Knights, a horn-driven ensemble, consisted of six brass players, one accordion and a drummer. Most of the polka dancing couples performed the “hopping” style of polka which derives from the north. In the first set, the band played four schottisches, two back to back and then four more in the next set. This filled the dance floor with all ages. Waltzes and polkas, for some reason, did not fill the floor with dancers. The big moment came each set when the chicken dance was announced. The chicken dance drew over 95% of the seated patrons, with an inner circle going counter to the outside. Large fun was had by all ages. At the end, one member pulled out ping-pong balls from under his chicken hat and tossed them to the kids on the floor. Afterward, I commented to the band that they must be paid better than Texas bands as six members had on chicken hats versus the one per band I have observed in Texas. Other observations included a large participation for the Seven Step Polka and likewise for the Mexican Hat Dance. When the Flying Dutchman dance was announced the floor filled. The dancers joined up in threesomes and foursomes and proceeded to do what Texians call the Garden Waltz. The Cabbage Patch dance was well known and performed by over a third of the crowd. When the Hokey Pokey was announced the floor once again filled and the crowd “put in” most body parts and shook them all about. Carolyn Strejskal and Irene Smrcka Littlejohn, who were volunteering at the front door, provided some wonderful insight to the hall. They told me that a lot of the regulars weren't in attendance, but their absence had been made up by two different parties celebrating family occasions. These two ladies, along with Marilyn, who worked the bar, popcorn machine and museum gift store are instrumental in keeping the polka tradition alive in Oklahoma. I would encourage anyone heading up I-35 through Oklahoma to take a left in Oklahoma City and drive 15 miles to stop in on a Saturday night in Yukon to Polka On. It was great to see a young couple crowned king and queen at the National Polka Festival in Ennis, Texas this past May. Jake and Jessica Holland won the dance contest to claim the prize. They love dancing and their Czech heritage. One of their duties is to attend other polka festivals to promote the National Polka Fest. They're looking forward to attending Westfest over Labor Day weekend. Over the summer, I had a chance to visit with the couple who just celebrated their second wedding anniversary on June 26. Why did y'all enter the dance contest? We entered for fun with hopes of winning! We really enjoy dancing together. What's your favorite polka/waltz? Jessica: Seven Step Polka because she grew up dancing it with her dad, and Black Gypsy Waltz. Jake: Pretty Dancing Girl and Hastrman by the Vrazels. Do y'all go to polka dances often? Yes, we both grew up going to weddings where polka bands played and go to dances if there are any in town. What are your day jobs? Jessica: pre-k special education teacher in Ennis. Jake: construction manager for the Beck Group in Dallas. Born and raised in Ennis, right? Yes. Jessica's entire family is Czech and still lives in Ennis. Jake was born and raised in Ennis and is a fitfh generation Czech Texan. What are some of your best memories of National Polka Festival growing up? Jessica - My favorite memories are being in the parade. I have dressed up as a Girl Scout cookie and handed out candy, rode four years as a high school cheerleader, and rode in my grandparents Vera & Wesley Betik's Model-A wearing a kroj that she had made when she was 16. It made me feel proud to represent my Czech heritage and happy to see so many people enjoying themselves at the parade. Jake- I remember as a kid always looking for the booth that sold rubberband guns, those were a lot of fun, and wanting to ride the carnival rides but mom wouldn't let me saying they were dangerous. (Now that I'm older I realize that she was right.) I also enjoyed riding on floats in high school when we had a float for the football team and again when I rode in a corvette as the SPJST State King. It was fun to spot and wave to my friends and family in the crowd. A specific favorite memory was when my great grandma Annie Martinek dressed up in her kroj and rode on a float in the parade. She was in her 90s at the time. What do you think would attract more young people to attend polka dances? For us, we grew up going to weddings that had polka music and listening to the Sunday morning polka show. Our parents, grandparents and great grandparents, instilled in us an appreciation for our Czech heritage including polka dancing. We think it is up to the families to keep the young people interested in polka dancing and promote it at a young age. Lufthansa celebrated its first flight of an Airbus 380 from Houston Intercontinental Airport with a German-style polka party and yodeling contest. The festivities were held on August 1 at the airport terminal with entertainment by Das Ist Lustig. Polkabeat fan Andi Meckna, much to her surprise, won the yodeling contest. Andi and her husband, Robbie, heard about the contest from Valina and Ross of Das Ist Lustig. The group has a standing gig most Thursday nights at King's Biergarten in Pearland where they offered patrons yodeling lessons to prepare for the contest. "We both tried yodeling about two weeks before the contest," says Andi. "I was awful but surprisingly Robbie turn out to be pretty good (even though he is not a great singer). Our plan was that he would yodel and I would do the costume contest." When the couple arrived at the terminal, they were the only ones out of about 500 people who had bothered to dress in costume. "So I knew we had the costume contest in the bag and we won that," says Andi, noting the prize was a dinner for two at Rudi Lechner's Restaurant in Houston. The yodeling was a different story. "They drew 10 names to compete in the yodeling contest and as fate would have it, my name was drawn and Robbie's wasn't," Andi says. "I was terrified because I have extreme stage fright. As I was on the stage, I looked at Robbie and knew that I had to win for the family so I belted out my best attempt at yodeling. Thank goodness there were no professionals competing." Andi made it to the final three and ended up winning with an altered version of The Hills Are alive with the Sound of Music. She says it was like a dream and can't believe they now have two round-trip tickets to Germany on Lufthansa A380. "It was such an incredible gift because I've never been and it was high on my bucket list," Andi says. "I have to thank Ross and Valina for their support and I could never have done it without Robbie!" The couple plan to take their trip in the spring of 2013. "Dreams really do come true," Andi says.